This is a simple trick on how to get promo code and save cost when order GoDaddy services such as Virtual Private Server (VPS), Dedicated Servers, Hosting & SSL. I don’t guarantee it works for you 100% but it worked for me at least 2 times although I’m a GoDaddy.com customer and is using Godaddy’s products (domains, server and web hosting). 4rapiddev.com was registered on Godaddy and being hosted on a Godaddy’s VPS. 2. Let’s choose a particular service, a dedicated server for example. 3. Go to its View Plans & Pricing page then Add to cart the plan you love. Mare sure you don’t make any payment, just play around. 4. Continue with your shopping cart and again don’t make any payment. Stay there for few minutes then leave/close GoDaddy website. Likely you haven’t make decision yet or you’re busy at the moment. Your order is almost complete. We know you’re busy, so we saved the products you left in your cart. 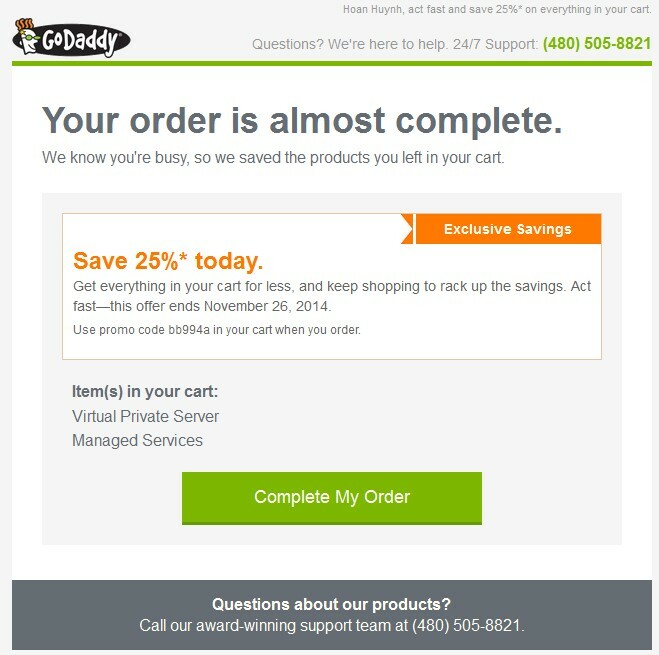 This is the email I received from GoDaddy with promo code to save cost up to 25%.